The linear solenoid valve (SLT) controls the transmission line pressure for smooth transmission operation based on signals from the throttle position sensor and the vehicle speed sensor. The TCM adjusts the current to SLT solenoid valve to control hydraulic line pressure coming from the primary regulator valve. Appropriate line pressure assures smooth shifting with varying engine outputs. The TCM calculates the amount of clutch slip based on the turbine speed, output shaft speed, and gear ratio. If the amount of clutch slip exceeds a specified level, the TCM will set this DTC and illuminate the MIL. When shift solenoid valve SLT remains on, the line pressure goes down and clutch engagement force decreases. If driving continues under these conditions, clutches will burn out and the vehicle will no longer be drivable. (d) Enter the following menus: Powertrain / ECT / Trouble Codes. 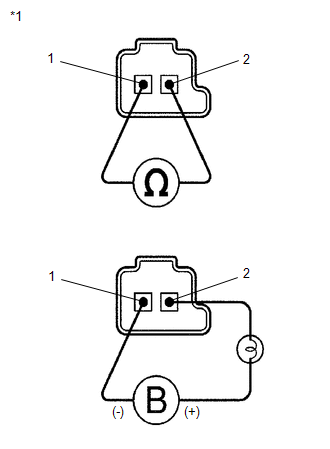 If a solenoid is stuck ON, DTCs for several solenoids including the malfunctioning solenoid will be detected. Be sure to prevent SST hose from interfering with the exhaust pipe. This check must be conducted after checking and adjusting the engine. Perform the test with the A/C OFF. (b) Lift the vehicle up. (c) Remove the test plug on the transmission case center right side and connect SST. (e) Fully apply the parking brake and chock the 4 wheels. (f) Connect the Techstream to the DLC3. (h) Warm up the Automatic Transmission Fluid (ATF). (i) Measure the line pressure when the engine is idling. (j) Turn the Techstream on. (k) Enter the following menus: Powertrain / ECT / Active Test. (l) Follow the instructions on the Techstream and perform the Active Test. (m) Measure the line pressure with SST. Operates shift solenoid SLT to raise the line pressure. OFF: Line pressure up (When the Active Test of "Activate the Solenoid (SLT)" is performed, the ECM commands the SLT solenoid to turn off). *: "Activate the Solenoid (SLT)" in the Active Test is performed to check that the line pressure changes by connecting the SST to the automatic transaxle. The same SST is used in the Hydraulic Test (See page ) as well. The pressure values in Active Test and Hydraulic Test are different from each other. The line pressure changes as specified when performing the Active Test. This test should always be performed with at least 2 people. (f) Enter the following menus: Powertrain / ECT / Active Test. Comparing the gear commanded by the Active Test with the actual gear enables confirmation of the problem (See page ). Operates the shift solenoid valves to allow gears to selected manually. This test can be conducted when the vehicle is stopped. When shifting gears using the Active Test function, do not operate the accelerator pedal for 2 seconds before and after shifting gears. The gear commanded by the TCM is shown in the Data List / Shift Status display on the Techstream. (h) Check the vehicle speed and the gear when the engine speed is 1000 rpm. Because the torque converter has not engaged, it may be difficult to obtain the speeds specified in 4th, 5th, and 6th gear, however a difference of speed should still be evident following each gear change. (i) Compare the TCM commanded gear and the actual gear. *2: If shift solenoid SLT is stuck on, the line pressure will be low. Therefore, the amount of torque that can be transmitted by each gear is lower than the normal limit. When the engine power exceeds this lowered limit, the engine speed will increase freely. *3: When shift solenoid SLT is stuck off, gear shifting is normal. (a) Remove shift solenoid valve SLT. 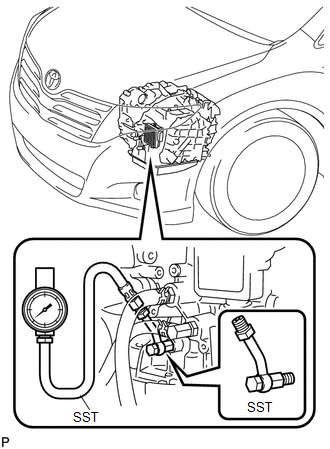 (a) Check the transmission valve body assembly (See page ). There are no foreign objects on each valve and they operate smoothly.